Here we go again. In the long term there are three things that determine prosperity: Growth, growth, and growth. 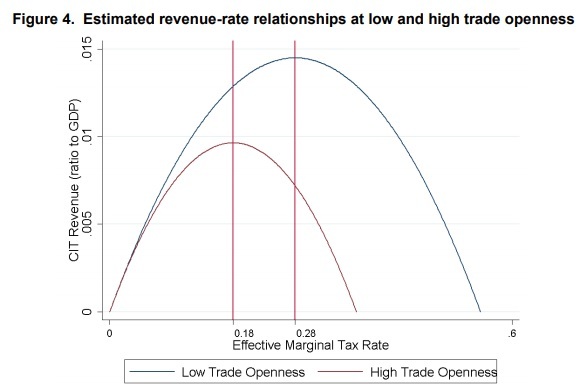 Revenue returns from tax increases ALWAYS decrease with tax rates once a country starts operating past the (early) peak in the Rahn curve. This is because in elementary arithmetic an exponent (however small) always dominates a fixed factor (however large) given enough time. So, to the extent that most countries operate at taxation levels that are well to the right of the early peak on the Rahn curve, any tax increase (increase in the fixed factor) will have a negative impact on growth (on the exponent). Hence, in the longer term, the detrimental effect of compounding foregone growth (and thus also foregone tax revenue) will trump any tax increase (i.e. any increase in the fixed factor). This is how low tax Singapore and Switzerland have come to collect more per capita tax than France and Italy and, most importantly, now have superior prosperity levels to show for it. …enjoy the tax and cronyism smorgasbord on the deck of the western developed democracy titanic… but be prepared to jump in a secure salvage boat.. …because the ship already starts taking in water while things seem just fine and jolly on the decks. …sure, a few Titanics will survive. But betting that yours will be one of the few that survives seems foolish. The survival will depend on chaotically serendipitous factors that affect electoral voter-lemming sentiment which are virtually impossible to predict (e.g. scandals, whether a Supreme Court justice candidate hit any other children when he was a kid in daycare etc…). The future of these western voter lemming democracies will be decided on these capriciously serendipitous events, not on the all encompassing fundamental issue of productivity incentives. Hence, a good preparation and practice on how to jump into and deploy a salvage boat will likely prove the best personal investment for any western world voter-lemming democracy resident. although Laffer may have used math correctly with empirical data, it begs the wrong question. The right question is “what tax rate maximizes societal productivity as a whole?” not “what maximizes government revenue”. This is touched upon by questions of government spending distorting the market. A government road may increase net productivity more than other expenditures, but a public school??? Hardly. I suspect the most optimal tax rate to improve productivity is closer to zero than its current value. Actually the argument should be for HOW MUCH OF OUR MONEY the government actually needs. Any amount seems to be not enough to them, they just want more for all their pet projects. So, I’d like to see an article addressing what the government needs if it only supplies the basic services enumerated in the constitution for them to be involved with. It is very few. Roads (infrastructure), perhaps schools in depressed areas- but not where the local citizens can fund it, courts, police, etc. As I said- the amount is not big. I certainly don’t need them taking my tax dollars and funding people who want to harm me. PLEASE address this in a column- its a bit of work, but you’re good at it.